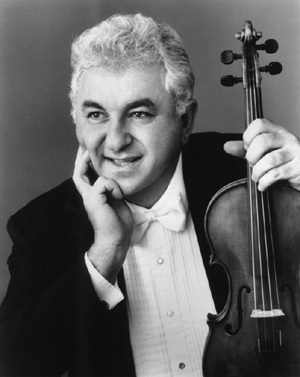 Concert artist and violin professor Sergiu Luca died Monday night in Houston from complications of bile-duct cancer. Luca held the Dorothy Richard Starling professor of violin position at Rice University's Shepherd School of Music, where he had taught since 1983. Born in Romania, Luca was nine when he debuted with Israel's Haifa Symphony, according to his Nonesuch Records biography. After studying in England and Switzerland, he came to the United States and studied with Ivan Galamian at Curtis and debuted with the Philadelphia Orchestra in 1965. A performance of the Sibelius Concerto with Leonard Bernstein and the New York Philharmonic brought him to the television airways, and thereafter he played with major orchestras the world over. He was a pioneer in the field of period-instrument playing and founded a number of chamber groups and series, including the Chamber Music Northwest summer festival in Portland, Ore., and Context, a period-instrument group based in Houston. Luca is survived by his wife, Susan Archibald, and their 4-year-old daughter, Lily, according to the NY Times. Here are memorials to Sergiu Luca from the Houston Chronicle and the New York Times. Russian violinist Nikita Boriso-Glebski, 25, won first place in the Jean Sibelius Violin Competition, which concluded last week in Helsinki. He won €20,000 in prize money, as well as an additional € 2,000 for the best interpretation of the Sibelius Violin Concerto. Second place (€ 15,000) went to Finnish violinist Petteri Iivonen and third place (€ 10,000) went to American violinist Esther Yoo, 16. American violinist Nancy Zhou, 17, of Texas, won € 1,500 for the best interpretation of Kaija Saariaho's "Tocar"; and American violinist Emma Steele, 20, won € 1,000 for the young talent award. The Sibelius Competition, founded in 1965, is held every five years and open to contestants younger than 30. Sphinx Organization Founder and President, Aaron Dworkin, has been nominated by President Barack Obama to serve on the United States National Council on the Arts. A number of stories this week emphasized the dire straits of classical music: a New York Times story featured the dismal employment situation for classical musicians; a Denver Post story has us Hanging by a Thread, illustrated by a picture of a violin with strings askew, bridge flown off, everything gone haywire. And then the news just keeps turning up bad, like the Louisville Orchestra filing for bankruptcy. No doubt, we have problems, but let's stay calm. The employment situation is no more dismal for classical musicians than it is for real estate agents, journalists, teachers, construction workers, car workers, you catch my drift. Certainly, we will need to find new ways to make a life in music, and they will involve a lot more entrepreneurship, but fortunately, things like CD Baby, YouTube, social networking, all help make this possible. And as for the other question, is classical music irrelevant? No. Does YouTube make people just want to sit at home instead of seeing concerts? Hardly. But certainly it's time to leave the long, constipated 20th century behind and evolve. The Internet and YouTube are the very tools that will help us disseminate the best of our musical history and bring it to those who will build on it, so that art music can evolve in the direction of cultural relevance. Young people seek authenticity; they can tell better than anyone what has been auto-tuned, what has been CGI-ed, what is "fake." No pandering: show us the good stuff and let us go with it. Here is an interesting interview on NPR, Weekend Edition (12/4) with William Harvey, a Juilliard-trained violinist who is now teaching violin at the National Conservatory in Afghanistan. He is also writing a violin method book based on Afghan folk melodies. Correction: Emma Steele is 20, not 30. "No. Does YouTube make people just want to sit at home instead of seeing concerts? Hardly." There's so many people playing their own instruments and posting the video on YouTube ... it blurs the line between producer and consumer. Far from making people want to sit back, it makes them want to make their own. The whole point of YouTube is that there is no "them" coming to hear "us." "Them" IS "us." (They are we, if you want to do the grammar thing.) That's probably the biggest distinction that the classical music industry doesn't understand. No velvet rope. If you've got your own guitar, then Bach belongs to you too, not just Hilary Hahn and Yo-Yo Ma. And if the classical world doesn't want to be mummified, it will care about this, celebrate it, and respect it, instead of reacting with dismissal. Rest in peace, Sergiu Luca. He was a dedicated musician and will be missed. May he join the ranks of the great violinists before him and may his legacy live on through his recordings, the chamber music festivals he founded, and his students.